I love everything about where we live. Our farm has woods and creeks and trails and wildlife. We have farm fields and small sections of native prairie and peace and quiet. We can look up at night and see the stars. And we can pee in the back yard. Of all the natural features of our farm there was always one that stood out as symbolic of the place. It towered above the rest metaphorically and actually. It was royal in its dignity and bearing. It captured my imagination the day I first laid eyes on it because it encompassed the spirit and the history of this farm. A giant cottonwood tree is a marvel to behold. If you are inclined to like trees and value them as I do you cannot stand under such a massive living thing and not be stunned by its magnificence. To me the cottonwood is all the more astounding because of where it comes from, a tiny seed only a millimeter wide and light enough to drift on the wind with the help of its namesake cotton. There can be no clearer definition of the word fecundity than to hold this tiny seed in your hand and then look up into the canopy of a tree one-hundred feet tall with a trunk six feet across and know that the one came from the other. My pet tree was a giant, indeed. It stood on the highest point of the hill north of my house (a bit unusual for a cottonwood, which prefer to keep their roots in moist soil). It was, I estimated, 85 feet tall and it had two main trunks each about 55 inches in diameter. 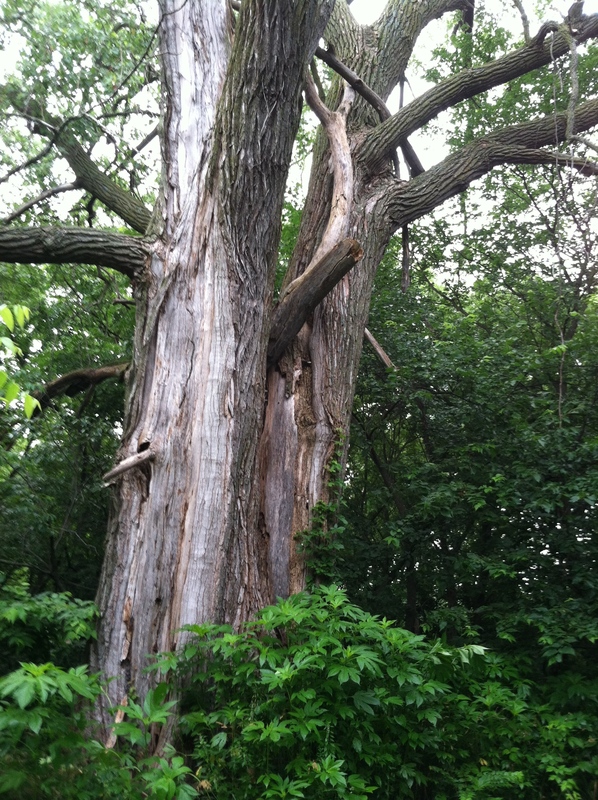 The two trunks joined near the ground forming a main trunk which was easily 20 feet around. It had a crown that shaded a circle 80-90 feet wide. By doing some rudimentary estimates and using the Missouri Department of Conservation tree age calculator I figured this tree was 110 – 120 years old. Compensating for the tendency of many little trees to get gnawed by rabbits and mice or be stepped on by cows or rubbed by deer it is possible that the tiny little seed which spawned my giant fell in this spot around 1890. Where its parents stood I do not know. They were not necessarily giants themselves and may easily have been made into firewood or simply served as fodder for fungi. In most cases a tree becomes a giant not because of its genetic superiority, although that helps, but because of the winds of fate and where they lay down the little seed. Even a giant doesn’t start out as a giant and little trees die by the millions in a variety of ways. Natural enemies abound. If you are a tree the aforementioned rabbits and mice take a big toll on you, as does weather. Too much rain in a given spot spells doom just as certainly as too little does. The buck deer rubs his antlers on you and the cattle (and before them the buffalo) graze upon you. If you survive long enough to grow tall the thunderstorm becomes your nemesis with wind to blow your limbs off and lightning to zap you. Finally, as sure as death and taxes, it is the insects and fungi who administer the coup de grace. As with most natural things, the surest path to destruction is to merely be in the way; in the way of man. You will not find big cottonwoods, or anything else for that matter, in cornfields or pastures. If you do find one it is sure to be in an area that was too inconvenient to farm or pave or build upon. In a three mile radius around our farm I know of three truly giant cottonwoods and a handful of big cottonwoods that may, in time, become giants. In addition to these I know of a grove of truly big burr oak trees (probably each 100+ years old) and a single massive monster oak even older (150+?). The common denominator of these ancient trees is that each grows in a very inconvenient and inaccessible place. The giant cottonwood survivors that I know about grow hard against a steep hillside or virtually in the edge of a creek. My burr oak grove (a second treasure of our farm) stands along the crest of an unfarmably steep hill overlooking a creek. These trees did not contrive to find an undisturbed spot to grow. They are simply the ones (or one) of millions which did survive. The others were lost because their tiny little seeds landed out in the middle of a cornfield, or in a lush green lawn, or on the hard-packed shoulder of the highway. Man still determines such things. But nature will find nooks and crannies; even nooks and crannies big enough for a 100 foot tree. It was the lethal combination of lightning and fungi that finally brought my giant down after 120 years of towering over this farm. It is testament to his strength that it took almost ten years after the fateful strike before my cottonwood lay prostrate in the ravine. I was home the night of the big storm and I heard the thunderclap as the bolt hit my tree. In the morning I went out to walk around the farm and assess the damage and I found bright, clean pieces of wood, some as much as two or three pounds, laying in the trail perhaps 100 feet from the big tree. When I looked up I could see a strip of wood about a foot wide and 50 feet long running from the base of the tree almost to the top of one of the larger west leaning branches. 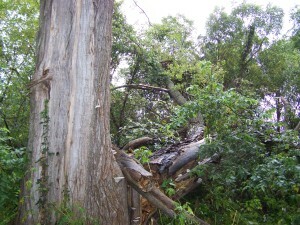 The strip of wood was six inches deep in places and appeared to have been exploded outward from the trunk of the tree. The exposed wood was clean and bright, not black or charred. The wound was enormous and deep. I figured that my pet tree would wilt and die in a short time. But it lived through that summer, and nine subsequent summers. The lightning had not killed it outright. It was very strong after 100+ years. But the ultimately fatal blow had been struck. What the lightning had done was to weaken the big tree and open its protective bark up which allowed the opportunistic insects and fungi to move in. After a year I started to see signs that the western trunk was trying to close up the wound. There was growth of “scar tissue” around the lightning blown channel down the side. A tree can recover from quite a bit. But the old cottonwood could not close over a foot wide fifty foot long wound fast enough. 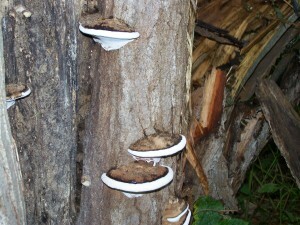 By year three I saw the first bracket fungi growing along the gap in the bark. I saw wood boring beetles and carpenter ants beginning to make forays against the base. Higher up the stricken branch had died and did not put on leaves during year two. Other branches on the western trunk showed signs of weakness. During a windstorm the third year the outer ten feet of the stricken branch fell to the ground, the impact driving parts of it a foot into the earth. By year four woodpeckers had generated numerous holes in the top of the western trunk up high. There were more bracket fungi and, ominously, some of these were now present near the base of the eastern trunk. By year five the eastern trunk was showing signs of failing, too, and I think this was the first year that the western trunk failed to put on leaves. Fungi now climbed higher along the western trunk and did not restrict themselves to the gaping wound area but were to be found near the junction of the two trunks opposite the wound. Year seven confirmed my fear that the eastern trunk was not going to survive without its comrade. And, for the first time, I became convinced that the western trunk was essentially dead. It began to shed its branches with regularity. I moved one of my bee hives from under its shade to prevent its destruction by falling branches. The wildlife, which are not subject to nostalgia, looked upon the dying tree as a godsend. The woodpeckers feasted upon the burrowing insects and their larvae. They bored holes in the dead branches which were then taken over by squirrels and made nesting cavities for other birds. For a while the taller branches were frequented by a bald eagle who found the high perch and lack of leaf cover agreeable for spotting prey. The hawks also relished this perch and I was happy to know that if I had lost my pet tree I could at least appreciate the red-tailed hawk’s breathy whistle on a summer afternoon. At length it was the insects who benefitted most from the lightning’s work. Unbeknownst to me they had penetrated the cottonwood’s interior and, along with the bracket fungi, had begun to eat out a cavity in the main trunk where the two branch trunks met, creating a cozy home, while it lasted. It lasted until last month. I came home from a trip and made my usual tour of the property to check out my garden and my bee hive and my decaying and maintenance hungry house. Though I had known the big tree was failing I had not expected that it would fall down. I had thought that over many years the big trunks would die and the tree would shed its massive branches one by one until it was a ragged skeleton against the sky. But it was, in fact, the still living eastern trunk which finally gave up the ghost. While most of the dead western trunk was still standing the big eastern trunk with leaves still on it had crashed down into the ravine taking out several lesser trees in its fall. 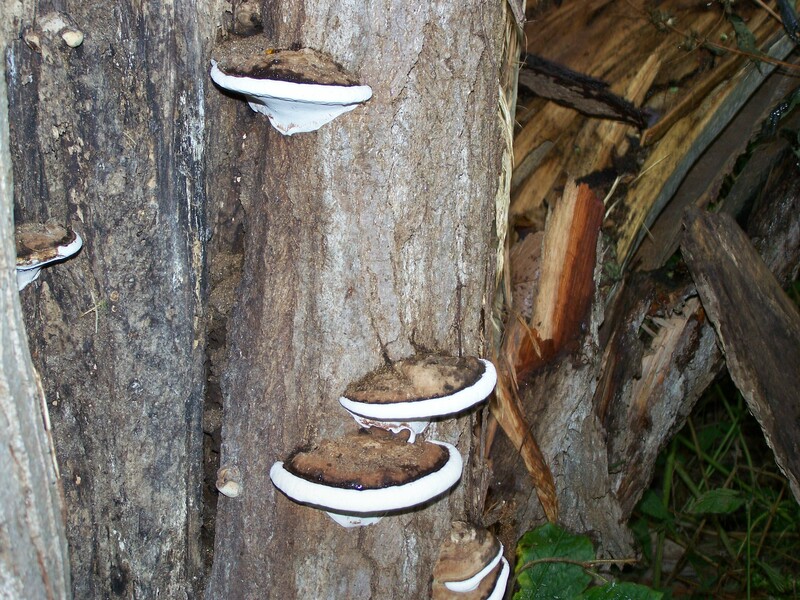 What I discovered was that the fungi and insects had hollowed out enough of the interior of the tree that, while it appeared strong and sturdy, the eastern trunk was standing by virtue of just a few inches of outer sapwood, the pith being dead and gone. It was not even a big storm that finally leveled my giant in heroic fashion. It was the slow but powerful effect of decay. Cottonwoods generally live to an age of 70-100 years. There are reports of trees older than 200 years but this is rare. The cottonwood was never a commercially desirable tree. Though called a “hardwood” its timber is light and, one might say spongy. It does not burn satisfactorily like denser hardwoods and is not generally considered useful for carpentry or woodworking. They have been used for such crude purposes as the manufacture of transport pallets. And cottonwoods have not always been welcome in polite company on farms and in the city. They are dioecious, like us, meaning that there are distinct male and female individuals that make up the population. The males produce catkins or flowers which release pollen in the spring. My giant tree was a male. But it is the female, whose catkins release huge quantities of seeds with their attached cotton, which often incurred the wrath of homeowners. A large adult female tree can release 48 million seeds in early summer. The resulting cotton can cover a yard, plug up gutters, and often blocked window screens in the days before air-conditioning. Whatever their detractors might say cottonwoods have many superlatives. They have a remarkable growth rate like other poplar family members, nearly double that of oaks. Young cottonwoods often have a sustained growth of 5 feet per year, in some cases exceeding 10 feet. They were the perfect species to take advantage of the native prairies of the midwest and west, a dominant subspecies is even called the Plains Cottonwood. They possessed thick corky bark which was resistant to the prairie fires which kept the plains clear of other trees. They were adaptable to dry conditions and wet feet. When you drive through Nebraska or Kansas or Colorado you are likely to see cottonwoods, and only cottonwoods, in any low basin or dry creek bed. In fact, it is said that pioneers, used to the dense forests of the east, were cheered and relieved to see cottonwoods on the horizon since they indicated a source of fuel and shade and probably water in an otherwise vast expanse of sere empty space. That is probably why the cottonwood is the state tree of Nebraska, Kansas, and Wyoming. I have liked to imagine my giant tree shading herds of bison and providing a perching and nesting site for passenger pigeons. These are probably fantasies merely. The bison were mostly extirpated from Illinois by about 1820, the last confirmed kills happening around 1809. There is a slight chance that a passenger pigeon perched, at some point, in my pet tree. Passenger pigeons could still be found in small numbers in Illinois into the mid-1890’s. One of the last known passenger pigeons in Illinois was shot in 1901 in Menard County. If my giant tree did not “see” the last passenger pigeons in our state some of its still-living cohort may well have. At the very least this magnificent tree saw the births and deaths of generations of our community. It stood on it’s hill, withstanding wind and snow and lightning and rain, bearing silent witness to the comings and goings of men. It lived through the Great War, and the other Great War, and a hundred lesser wars since. It saw the Great Depression and the Cold War and the Farm Crisis of the 1980’s. It saw the Wright brother’s first flight and a man on the moon and I just took its final picture with my IPhone. All this time it stood silently on its hill and watched the world go by. Old things and old people are worth respecting and worth contemplating. We all become old things if we are lucky and if we do not gain wisdom we at least witness a lot of history. My giant cottonwood witnessed a lot of history. This link to our past is important, I think, even if you are not willing to call yourself a tree hugger.